A much better design than Grippo's other packaging detailing. The red to yellow breaths fiery hot. 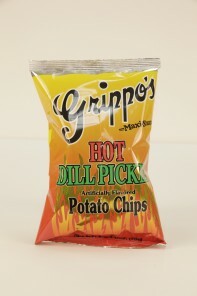 The Red 'Hot' and green 'Dill Pickle' stand in the flames below Angelo Grippo's autograph. It is still very basic and child-like in detail and thought, but an improvement on the others bags, nevertheless. As with all of Grippo's Chips, the oil softens the crunch, the thickness softens the crunch and the seasoning hardens the crunch. All in all, a bit more like biting into food rather than a Chip. These Potato Chips were darker than regular Chips and covered in a thick seasoning powder. They did not feel oily at first, but a bag plunge later and fingers were messy with an extra coating. While many Chips makers are running around anxiously worrying about increasing public health conciousness, and their part in the great Trans Fat scandal, Grippo's are merely concerning themselves with flavor and taste. And these Chips are undoubtedly tasty. They start off mild, but then some reasonable heat kicks in. Dill should not be an over-powering flavor, you should still get some sweetness, some potato and even a little salt, and these do it pretty well.